Let the fun begin! School's out and it's time to kick off the ultimate summer vacation in the Northeast Kingdom! Newport's Summer Rec Program brings back all the long-lost favorites like biking, fishing, arts & crafts, swimming and field games. Every day at camp is a new adventure where kids can build lasting memories with friends new and old. At Rec, we strive to create a fun and friendly atmosphere in everything we do. Our staff is certified in CPR, AED, First Aid and carefully chosen based on their excellent leadership qualities, positive attitude and ability to CREATE FUN. Your kids will remember them for a lifetime! From first-timers to seasoned campers, local or visiting, we've got something for EVERYONE. Prouty Beach is the perfect summer location on the shore of Lake Memphremagog, surrounded by several playgrounds and amenities. Our days are filled with outings on the bike path, to the library and neighboring parks providing a unique adventure every day! Excursions and experiences at our Newport Recreation Program are ones to remember. 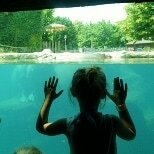 Trips to the zoo, water park and neighboring beaches are a summer highlight for many campers and counselors but when we stay home, we have just as much fun! Theme weeks like Color Wars, African Drumming and our annual Camp-out will become fast favorites as we explore traditions found only at summer camp! Fishing and biking are summer past times every child should experience and at camp we practice them weekly! 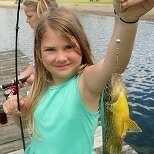 Many of our kids graduate from training wheels and catch their very first fish while at camp! Anything is possible with the support of friends and an encouraging staff. Throughout the summer, children learn to master these lifetime skills and will love coming to camp on fishing and bike days!